The hobby of stamp collecting – I would not hear of philately for many years to come – fascinated me from an early age, not least because of my father’s stamp album that nestled among the books in a glass-fronted bookshelf. I began my own modest collection by tearing off the stamps that arrived on letters in the mail – these stamps turned out to be a treasure trove for me. I learned how to soak them, dry them and affix them to the pages of my first stamp album with special little hinges. What a fascinating world opened up for me as a result! Naturally enough, I suppose, stamps from countries other than South Africa seemed exotic and so much more interesting at first. I loved finding these countries in our atlas and – one of the unexpected benefits of this hobby – began to enjoy scouring the newspapers for news emanating from some of them. Reading newspapers from wherever we happen to be is an interest that has long outlived my ability to continue with philately as a hobby. 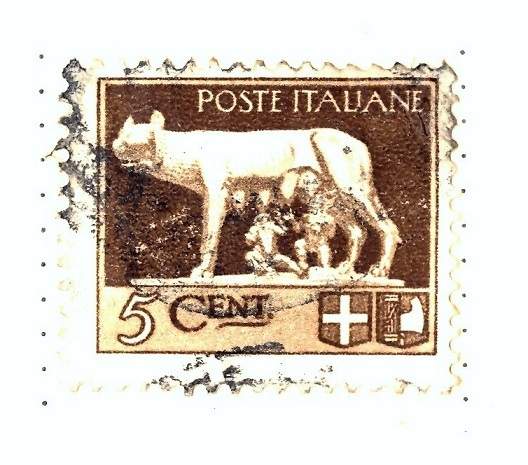 My father’s album contained stamps from countries I could not hope to find on the envelopes that came into our home – he must have begun his collection in his youth, although he added to it from time to time in a haphazard way. It was through studying the images on these and talking to my parents about them that I became interested in knowledge for its own sake. The original looks as smudged and indistinct as this scan indicates, yet it fascinated me to be told of the story of Romulus and his twin brother Remus, the legendary founders of Rome. What a story! Their trough floating down the River Tiber is reminiscent of Moses being found in the bulrushes. That they would be rescued and suckled by a wolf until the herdsman Faustulus found them fired my imagination, which became quite ready to accept the story of Mowgli in Rudyard Kipling’s Jungle Book. What a feast of reading these links led to – another source of joy that has remained with me, including reading about the adventures of these twins many, many years later in Virgil’s The Aeneid. It was the essayist and poet, Joseph Addison (1672-1719), who wrote that reading is to the mind what exercise is to the body. Imagine a world with no reading – can you imagine living in this century and not being able to read? When I was about three years old, my family used to tease me for begging my father to paint the water tanks on our farm “the same pretty colours” as I saw on the tanks outside the roadhouse we passed regularly on our trips between the mine where we lived and the farm where we spent weekends. It was only once I could read that those ‘pretty colours’ turned out to be the logo for Castle Beer! No wonder my father preferred to paint the farm tanks plain silver! We once employed a casual gardener in Mafikeng. He was talkative, filled with energy and would sometimes contribute plants he had found growing on the mounds of rubbish tips that abounded in the fledgling suburb we lived in. This man was canny and meticulous about money – yet he was unable to read a word in Setswana, English or Afrikaans, nor was he able to write his name. He had never attended school, you see. I often thought about how bewildering it must have been for him to enter a supermarket or to find his way around the administrative aspects of his life. During my years of teaching, from pre-primary to university, and in both government and private schools, I have come across young people who are reluctant readers. These children tend to shy away from reading aloud because they cannot pronounce words; have to mumble over words the meaning of which is a mystery to them; or lose their place because their eyes are unused to following the line of print. They read haltingly as they decipher the pattern of each word in turn; or they read in a deadpan fashion because they have not grasped the concept of how to read dialogue, or to emphasise certain words, or even to play with their voices to make what they read both more interesting and more meaningful for those listening to them. Some of these children will never heft a book from choice. They will not feel its weight, smell its pages, or gauge the possibilities of what lies between the covers. For some of these children even reading a magazine article remains daunting. I once taught a Grade Eight girl who proudly brought her Kindle to the lessons set aside for reading. It took her a month to advance ten pages and she was taken aback when I noticed. 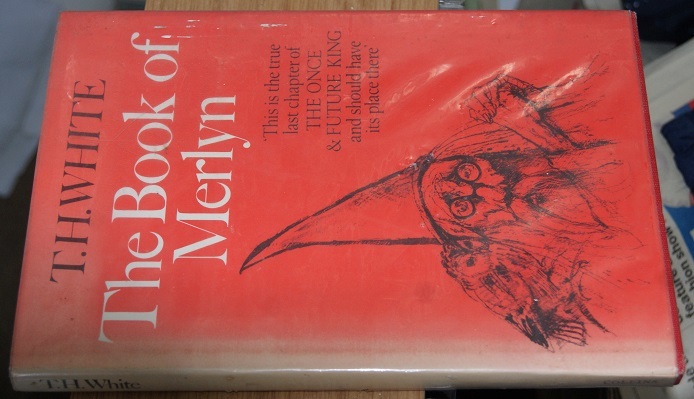 A matric boy, who loved hunting, kept renewing a library book on that subject for three months because it took him that long to read the first two chapters. By the end of the term he assured me that he had read “all the captions of all the photographs”. Indeed. If reading is to be exercise to the mind, then it is a skill that requires practice. The element in this becoming a successful exercise for the mind is that it should be enjoyable. When we enjoy what we read, we unwittingly develop the skills needed to tackle ever more demanding texts, or to delve into the intricacies of the written expressions in a variety of genres. Reading skills underpin the success of studying content subjects such as history, geography and life sciences at school and facilitate learning throughout our lives. This has been brought home to me whilst engaged in reading examination papers for a Grade Ten pupil. The Business Study questions were simply expressed and so, once I had read through the paper for her, she only required me to reread the two longer questions at the end. The English paper took its toll: I read and reread the comprehension passage, the article to be summarised, and the two seen poems at least three times each. She listened intently, following the words on her script while I read aloud. She asked me to reread some of the language-usage questions too and wrote until even her extra time was up. Her comment afterwards was that during my reading of Mending Wall by Robert Frost, she felt she could really understand for the first time what had happened to the wall and how differently the two farmers felt about it. “It’s how you read it,” she said by way of explanation. I thought the Mathematical Literacy paper would be a cinch. The first three questions were and I began to wonder if I was superfluous, merely keeping her company in this isolated venue. Then came the three longer questions. They were not difficult by any means, but contained information that needed to be assimilated and digested before it could be applied to working out the running costs of a chocolate factory for three months, and the quantities of ingredients required to make a hundred slabs of chocolate. Another question required her to work out which option of tea bags would be the cheapest for Sipho to purchase. She could do this, but only after the verbal contextualisation of the problem had been read to her – as one would read a story. As I have done in similar situations, I asked the girl how she felt she benefited from having the examination scripts being read to her. “They make more sense to me,” she answered. “The way you read makes everything seem more real to me somehow.” I take no credit for this. Indeed. Like so many others, she has denied herself the pleasure of hefting a book from the shelf of the school library, breathing in the smell of the printed page, and being transported to another world far removed from where she is. That vital exercise of reading for the mind is missing – hopefully she, and others like her – will embrace it sometime in the future simply for the fun of it. I am a bibliophile. The first signs of this appeared when I was very young. 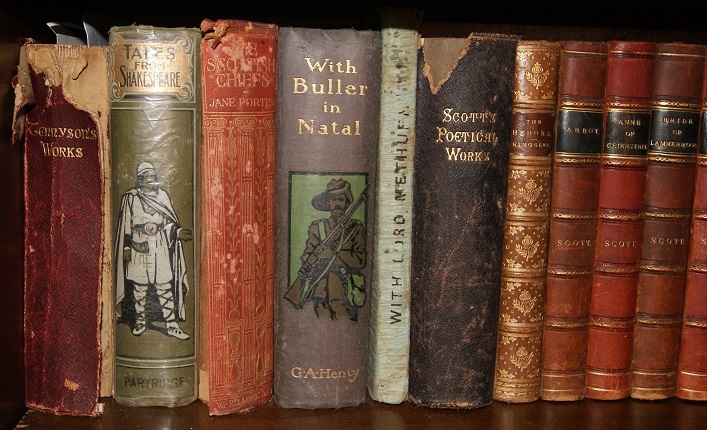 There were few childrens’ books in my home and those we had were treasured beyond belief. Reading became a magical form of escapism for me. 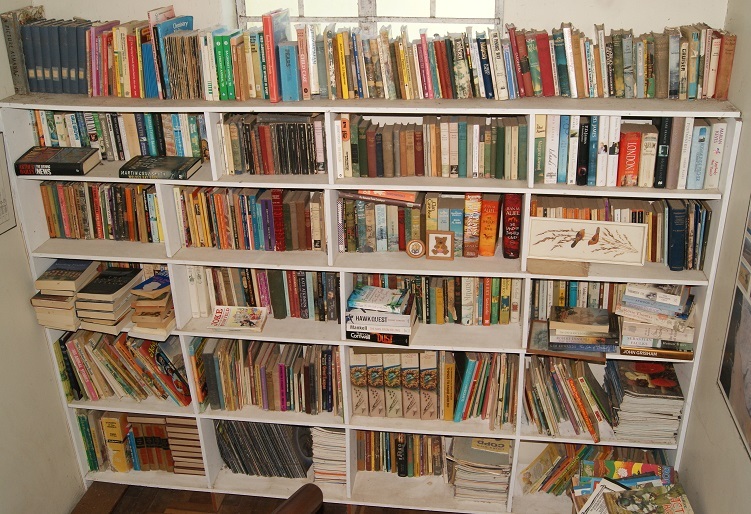 Once I had worked through the tiny library of my primary school, I would look forward to the arrival of the Provincial Library Services van that would periodically replenish the stock of books in the minute public library (it consisted of two cupboards) of the small mining village I grew up in. Moving to senior school with its much larger library to explore was the beginning of an adventure that has never stopped. As a child I often devoured books (and lemons) while sitting in the comfortable branches of an enormous rough skin lemon tree at home, happily hidden from view. On our farm I found a comfortable mango tree. A very large white mulberry tree also provided a cool haven for reading undisturbed. Not only did this mean I could escape into the world of the book I was reading, but such hidey-holes saved me from the inevitable teasing from my brothers, who would laugh at the sight of tears running down my cheeks. “It’s only a story!” they would sometimes jeer while I keened over the events held fast between the covers on my lap. I have always been drawn to book sales and find the bookshop in any shopping mall is a natural place to wait for someone. 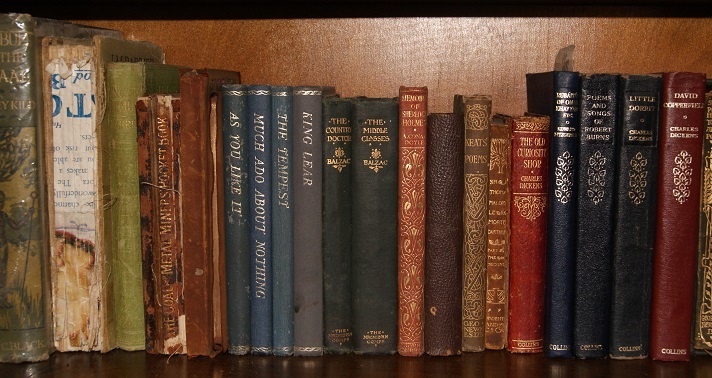 I have stayed in places with a small library of books where travellers are welcome to take one to continue their journey with, providing they leave one behind. Difficult as it is to part with a friend, it is great to make a new one along the way. Moving house with an ever-expanding collection of books has meant building shelves to accommodate them – and more shelves – and more shelves, until I sometimes think if we add one more book the whole house will collapse. We now have books in the lounge, the dining room, the passages, the landing and in various rooms throughout our home. Despite the shelves, books still pile up on tables and on the floor. I discovered very early on that once the reading bug bites one has a companion for life. For some it is biographies, others prefer thrillers, many enjoy non-fiction, and there are others who give themselves up to magic realism or romance. One of the aspects of travelling I enjoy is seeing what books people bring with them to read at airports and while camping. These days I usually alternate between reading fiction and non-fiction. The two genres are often linked. Last year, for example, I read a fascinating novel by Thomas Keneally, The Daughters of Mars, which dealt with the role Australian nurses fulfilled during the First World War. I was so intrigued by the detail he went into – learning a lot in the process – that I am now reading an historical account of nurses on the Western Front. 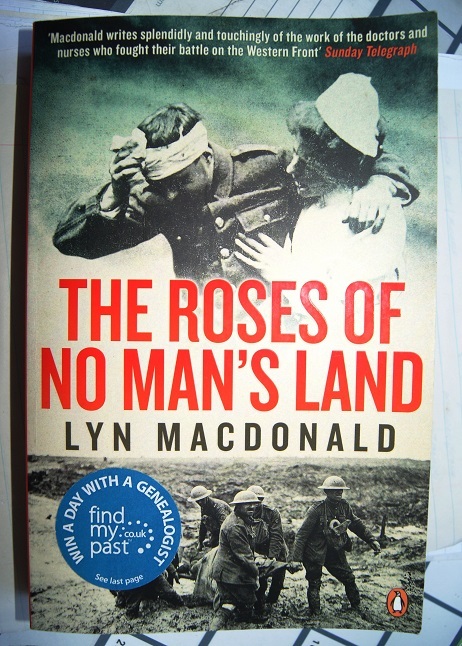 The Roses of No Man’s Land by Lyn Macdonald is a must-read! Shelved rows of books warm and brighten the starkest room, and scattered single volumes reveal mental processes in progress – books in the act of consumption, abandoned but readily resumable, tomorrow or next year. John Updike, writer (1932-2009).